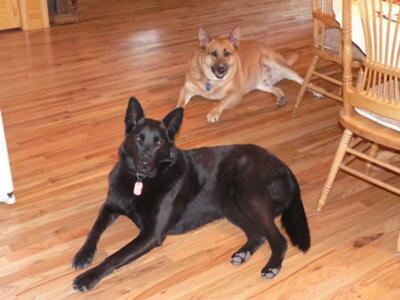 Ranger = Black GSD found abandoned as a puppy almost frozen to death. No papers of course – vet and local breeder feel he is all GSD but no one really knows. The black dog was found in the cold of December on one of the mountains in our area – he was about 3 months old and had obviously been abandoned. Cedar = Brown GSD mix of some sort – found on freeway in Atlanta as a three year old – taken to rescue center. The brown dog is Cedar and was at an Atlanta rescue center. We saw his picture on the Internet – he had been to 4 homes but they all found out he was to big for their life style. He is perfect for ours – he is now in his forever home in the mountains and has bonded well to Ranger. Both dogs have been together for over 2 years now and they are family. Both are neutered males. Rescue dogs need homes also. Hey there, Richard. It is good to hear from you. Thanks so much for taking the time to come here and sharing your German Shepherd Dog rescue stories with us all today. Love the picture - They look soooooo comfortable just hanging out!